Having a problem with your spa? Swims & Sweeps has the most qualified technicians in the industry, servicing all major brands of spas. If you find yourself in need of hot tub repair or maintenance, Swims & Sweeps is here to help! Whether you use your hot tub for relaxing, entertaining, or the perfect night with that special someone, it is our goal to get your hot tub repaired, so you can go back to enjoying it. 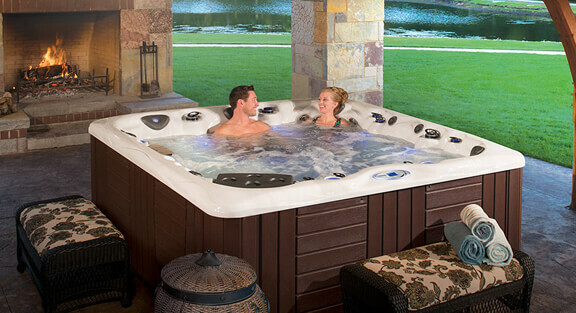 Our technicians are skilled in the repairs of most brands of spas and hot tubs. The new hot tub and spa models have far more bells and whistles than the older models. Today’s hot tub and spa repair technicians need to be skilled in working with the advanced control systems found in most newer model hot tubs. At Swims & Sweeps, you can rest assured our technicians have the knowledge and skill set to repair the newer high-tech hot tub models. Call Swims & Sweeps to schedule your hot tub or spa repair service. When the spring and winter months roll around, make sure your spa is ready. Swims & Sweeps offers hot tub opening and closing services to ensure your hot tub is ready to use in spring and ready to hibernate in winter. Call us to find out more about our competitively priced spa opening and closing services.